The majority of the par-5s in Southern California are of the grip-and-rip variety that after two solid shots either result in a putt or short pitch for eagle or birdie and you usually end settling for par. 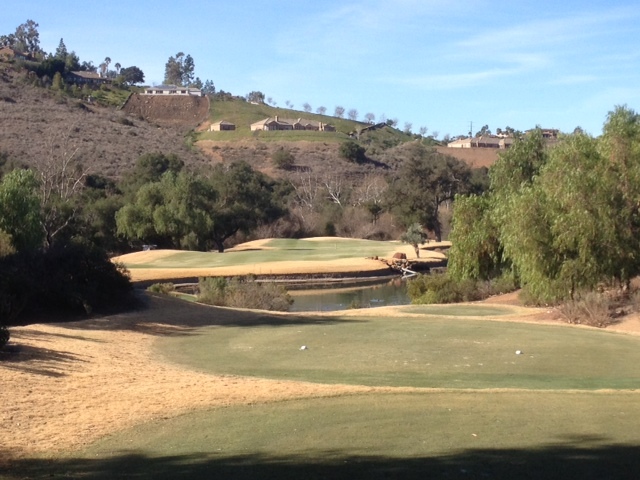 As a group, the par-5s at Maderas Golf Club in Poway require more precision, strategy and execution than any other group of 5s in So Cal. I’m open to other candidates, but right now this is my pick. You don’t settle for par on Maderas’ par-5s; you savor them. 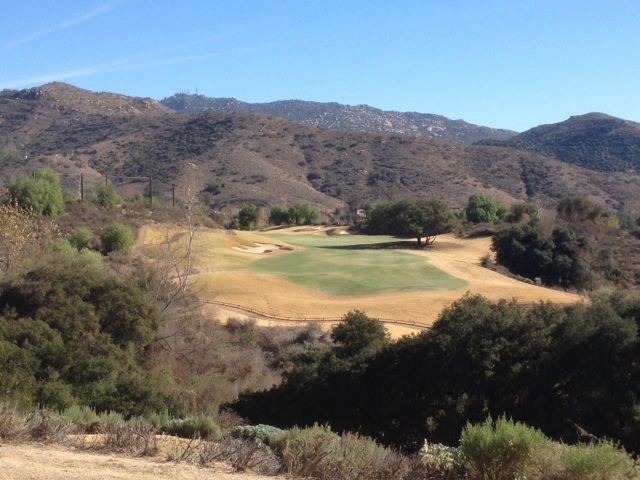 If you haven’t played Maderas, it’s a public course with country club amenities located just off the 15 past Rancho Bernardo Inn. It garnered a top 100 ranking among U.S. public courses by Golf Digest for the first time in 2013. Maderas is love at first sight to a golfers’ eyes but that design mastery can induce initial misery without a little guidance. It especially takes a few rounds to learn how to properly club the highly strategic front nine. The back nine is more open, but distance becomes the challenge as the course lengthens out considerably. 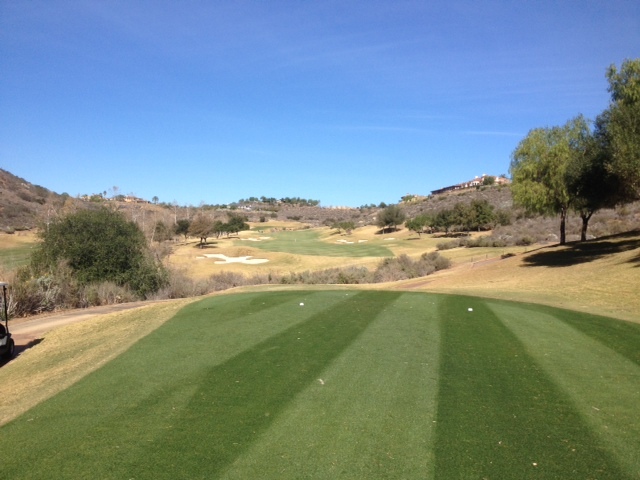 But the meat of Maderas is the par-5s, all of which incorporate a carry either off the tee or to the green. In that way, Maderas is like the Crossings, the difference being you can get away with a mistake at the Crossings more so than Maderas. My take: This hole is golf’s answer to bumper bowling. As long as you don’t go extreme left or extreme right, a bowled fairway will not only keep you in play but probably bring you back to center. In that sense, this is the easiest of the par-5s. It’s also the only one that’s downhill start to finish. Less than driver will do off the tee if that helps you hold the fairway. You’re unlikely to get home in two on your second so be smart. Going for it on your second will likely land you in the ravine that’s waiting for you about 120 yards out from the hole. I know because that was my fate once after ripping a 3-wood. I found my ball next to a boulder and made a crazy up-and-down off the boulder that I don’t care to repeat. I’ve learned to take my 6-iron/7-iron layup and like it. The other likely outcome is carrying the ravine but being right of the green and watching the slope run your ball off into the woods OB. I’ve done that, too. 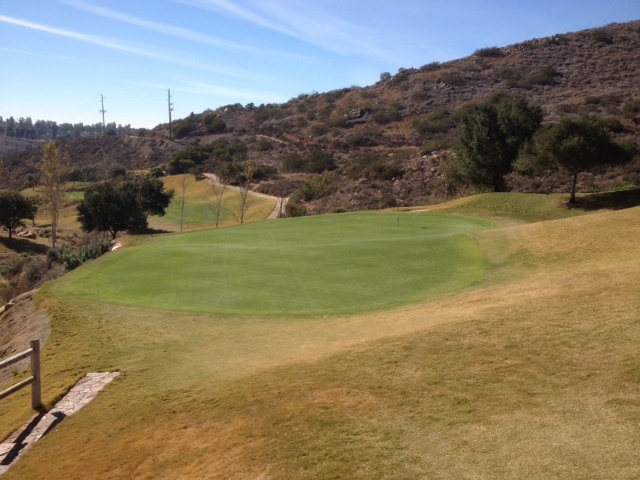 So take the layup, cozy a wedge in and take your chances on Maderas’ slick roller coaster greens. The opening four holes might be the most score-able stretch on the course if you’ve got your game together. Take advantage by being smart. My take: The par-4 5th is the No. 1 handicap. My Maderas member friends think this hole’s tougher. Either this or the tee shot on No. 16 has to be the toughest tee shot on the course. Sliding a drive past the tree in the middle of the fairway and keeping it from going OB left is position A, but it’s also a very tight fit. Anything less brings that huge tree into play and will likely leave you to execute some sort of knockdown shot to a narrow uphill fairway to give yourself any kind of look at the green. And anything right into the lake or right of the lake is OB. If I hadn’t experienced a par-5 at Dove Canyon that played like hitting it down a high school hallway, this would get my vote for the toughest par-5 I’ve played in SoCal. It doesn’t help that my draw does my absolutely no good off the tee here. Take the book’s advice here. Obviously I’ve got nothing but bogeys and scars to show for my rounds on this hole. My take: Don’t believe the yardage here. This hole plays much longer. And if you’re really want to feel what it’s like to have a lot of golf hole on your hands, try it from the 552-yard back tees. The tee shot isn’t so much the challenge here. I’ve missed this fairway left several times and been able to get back into position. The problem is biting off enough fairway on your second to put you in reasonable position for a very difficult approach over a ball-swallowing canyon. The green is elevated, thus the extra club, but I advocate one more. You can only afford to be short here if you find the bailout left, which I did last time after going 3-wood/rescue/7-iron. I still made bogey as my pitch caught up short of the green. This is a the first of two long-distance par-5s on the back that don’t give up par, much less birdie, without a fight. My take: What a finishing hole. First of all, the bird’s-eye view of the 18th fairway also provides a glimpse of the back nine, giving you one a stunning perspective and appreciation for the course. The key to your tee shot is the mature oak tree sitting on the right side at the turn in the fairway. This is your aim line. You ideally want to end of left of it, leaving an ideal angle for your second. Even right of the tree, leaves with you a shot. The sand traps left aren’t crippling for your par chances, but OB left or short is. I have a witness to testify that I’ve reached this green in two, but it took a flushed 3-wood. With a decent tee shot, a more conservative play will leave you in scoring range and not risking the green-side creek on the right. After No. 3, I deem this to be the second easiest of the par-5s, but the caveat is the undulating oblong green. Depending on pin placement, you can get some breaks on this green that will simply defy belief. Once you experience it, you’ll know. But all in all, this hole does what I think a great finishing should do, which is give you a last chance at glory. After stumbling through 14, 15 (tough par-3), 16 (par-4 w/tight tee shot), I’ve often salved my round on 17 (short par-3) and 18. That’s another reason I’m partial to this hole. It’s shown me a little mercy on a course that doesn’t show you much if game isn’t spot on. Yet, I still keep coming back hoping to be up to the multiple challenges Maderas’ par-5s throw at you. Maybe next time I will be. 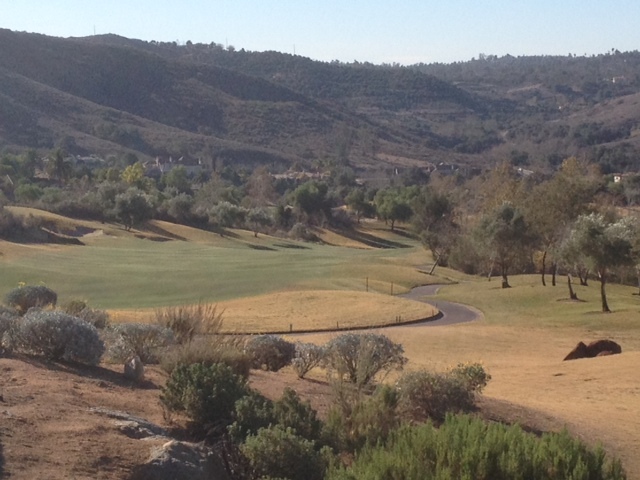 This entry was tagged Maderas Golf Club, Par-5s, Poway. Bookmark the permalink.